I’ve just realised that I haven’t written anything about Batu Feringghi or its beach. To be honest, I wasn’t a fan of the town, or the resort, itself – just a road running past the beach and lined with eateries and a few hotels such as the one I was staying at, the Lone Pine. To be honest I found the eateries a bit intimidating – there’s a picture below that might explain why that was. The big attraction (?) in BF (apart from the beach) is the night market. This is basically many, many market stalls running alongside the road and filled with – stuff. There was nothing there that attracted me. Quite a lot of the stuff looked like it was fake – there was one stall selling stuff that looked as if it was labelled Cath Kidston, but for very low prices, while another stall had what at first sight looked like Lego Star Wars kits, but if you looked closely you could see that they were made by “Lelo” and were in that company’s “Star Wart” range…. The pictures were correct, so it was pretty much a rip-off of this model. But basically the night market left me cold. Or hot, actually – the stalls are built right up against the road so the only way of getting along is by walking through the middle of the stall, and they were hot and crowded. I did enjoy walking up the beach, however. It’s a beautiful setting – a crescent bay, hills at each end, and the sun sets behind them. There weren’t many people in the water, which given the health warnings I’d read about the pollution was understandable. There was a lot of water sports, and one or two beach bars. I decided to patronise Bora Bora, and had a good time there. I also ought to say that the hotel was very good – very restful. My main reason for going to BF was to have a break between the visits to Singapore and Dubai, which I expected would be hard work (though enjoyable). The day spent around the pool at the Lone Pine was very relaxing, and I certainly enjoyed the couple of hours in the the Bora Bora beach bar on my last evening there. Today I visited George Town, the main city in Penang (which is itself a state of Malaysia). This required a bus ride, on a local bus – but as ever with these things, it was all absolutely straightforward and easy. And cheap, too – the cost of the rid, about 20 kms or so, was MR2.70, or around 50 pence, each way in an air-conditioned bus. George Town is a strange place. You could say that it was “nearly Singapore”. Like Singapore (and Malacca), it was one of the Straits Settlements, and in fact was claimed by the British (or by the East India Company) almost 40 years before Singapore. For much of the 19th century George Town (and Penang) was at least as important to British interests as was Singapore. I believe that it was only in the 20th century, with the development of the naval base and associated land defences at Singapore, that that city got ahead of Penang in economic and political terms. And in the end, of course, Singapore ended up as one of the world’s city-states, free to put the interests of the city at the heart of the nation. George Town wasn’t as fortunate. That said, it’s apparently still the second most important area of Malaysia, economically-speaking. It has a city population of 700,000, while the urban area that it commands has a population of 2.5m. Much of downtown George Town is dominated by all the paraphernalia of a modern eastern city – high rise apartments and hotels, and shopping malls. But that’s not what I was there to look at. I was interested in the George Town World Heritage area. This consists of a labyrinth of small streets close to the old port area where formerly the traders, merchants and craftsmen (and women) of George Town made their living. Essentially the streets consist of terraces of buildings, the ground floors of which were given over to business while the first (and sometimes second) floors were given over to living quarters. The enterprise on the ground floor could be anything – a workshop, a small warehouse, a merchant’s office, a retail or wholesale premises, somewhere that sold food and drink – whatever economic activity could be fitted into the structure and from which people could make a living. As I said, it’s very reminiscent of the older parts of Singapore, and i believe that the term ‘shophouses’ applies to the premises in George Town as well as Singapore. By the 1970s & 1980s things had moved on – the new technology of trade (containers, global networks) rendered much of these old premises redundant, and the older area became very run-down and dilapidated. But the area was declared a World Heritage site in 2008 and various protection measure put in place to preserve the architecture, and it’s become a major tourist attraction. Along the covered pedestrian footpath. One interesting aspect of the area is that there are a number of Chinese temples. These too are historic (late 19th century in some cases) but I have a feeling that the actual buildings may have been renewed since then. A few of them are very grand. I also visited one of the Clan Jetties. These are structure that were originally based on boats joined together and projecting out from the shore into the sea, by more than 100 yards. On this structure were built houses and some business premises, and later shops. They were built by the Chinese and each of the jetties was built by a specific clan or extended family. I visited the Chew jetty and I gather it’s the case that many of the current residents (they are still lived-in) are members of the original clan. Finally, I must report that while in George Town I ate local. I visited a tandoori shop in George Town’s Little India for lunch. Formica tables, simple menu, and I was told what to order – Tandoori Chicken with plain naan. Delicious; and incredibly cheap. The chicken and naan cost me the equivalent of £1.50, and, big spender that I am, I bumped it up to £2.50 by adding a glass of really thick mango juice. I spent most of yesterday travelling, which was interesting and frustrating. 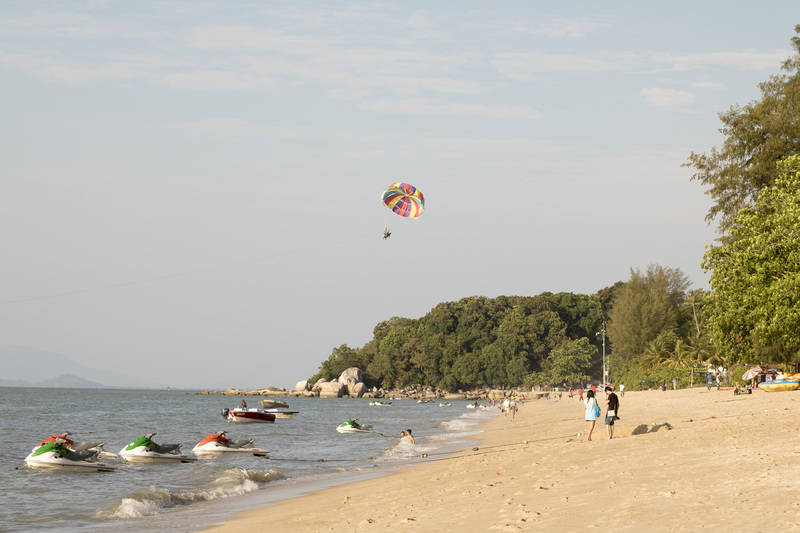 It took six hours to get from my hotel in Singapore to the one one in Batu Feringgi in Penang, Malaysia, and of that time only 75 minutes were spent in an airplane. I was at Changi airport (Singapore) way earlier than I needed to be; the flight was completely straightforward; and it then took over two hours to get to the next hotel. Lots of traffic. I explored Batu Feringgi a bit last night, which basically meant a stroll up and down the main strip. Maybe I was just tired, but it didn’t impress – it seemed very ramshackle. The main feature is a ‘night market’ of hawkers’ stalls all along the road which you have to walk through – they occupy the pavement – and to be honest there’s nothing there that remotely interests me. Then there are the restaurants, most of which seem to be cavernous corrugated iron structures, with random tables and chairs set out inside. Most disconcertingly of all, of course, are the menus full of food that I don’t understand. So I ate at the hotel – it was buffet night – and later walked back up the street and had a glass of wine in a bar I found. Today I decided to have a lazy day. I got up late and hit the poolside at a bit after 10 o’clock, and didn’t move from it until nearly 5 o’clock. It was a wonderful lazy time, with regular deliveries of ice-cold water. In fact it’s probably the laziest day I’ve had for a long time. At five o’clock I did a bit more exploring and located an ATM in a more developed part of town, and also walked up the beach. On the way back I found a beach bar and enjoyed a glass of white wine. Now I’m back at the hotel about to prepare for dinner and probably more alcohol. It’s a hard life.